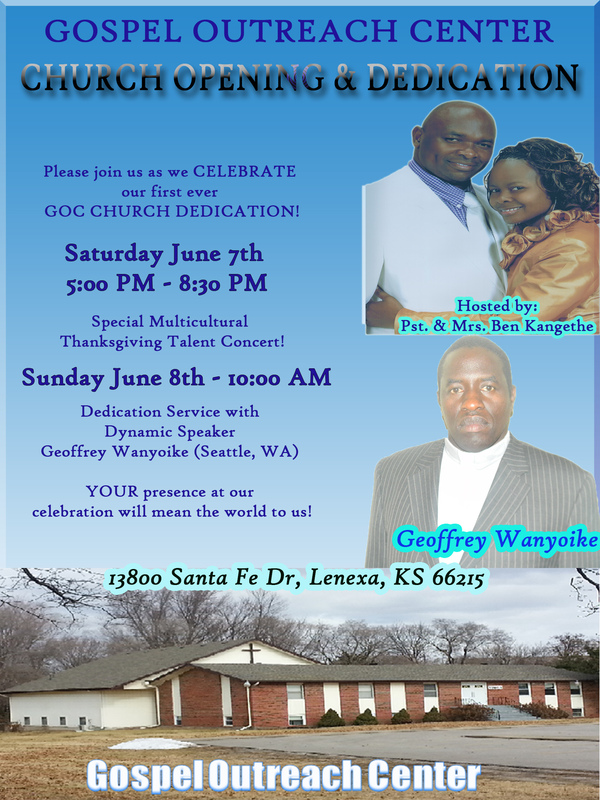 June 8, 2014 was a special day for Gospel Outreach Center Kansas City. It was the Official opening and Dedication of our Church Building. It also happened to be Pentecost Sunday, which falls 50 days after Easter, celebrating the descent of Holy Spirit on the Apostles. It was the climax of a long faith journey, moving from Vision casting to seeing it being fulfilled. The journey was fueled with prayer, faith in the almighty God and unwavering commitment of Gods people to the vision. It was not the work of one person but many. We had those who laid the foundations, masons, carpenters, electricians, plumbers, floorers, painters, transporters, material suppliers, food suppliers and cheerers. All these folks played a great role to see to it the work came to a great finish, May the Lord be praised. It was also great and glorious occasion where the glory of the Lord came down in a great way. From Praise and worship, powerful preaching by Pastor Geoffrey Wanyoike, Leadership, Members and Building Dedication to the Lord, Plaque unveiling, tree planting and a great lunch, It was all awesome. The door the lord has been flung open and no man can shut .it’s a new day for Gospel Outreach Center. We truly appreciate GOC Members for carrying such a great task with great love, commitment and sacrificial laboring to make this happen. You are awesome people and we love you. We also appreciate all our friends across the Globe who partnered and walked this long journey with us to make this happen, may the Lord richly bless you. Finally we truly appreciate those who traveled this weekend near and far to come and join our GOC family in Celebrating God’s faithfulness. To God be the Glory.